HOW IMPORTANT IS IT FOR YOU TO MOVE ON WITH YOUR LIFE? Do you find that you are your own worst enemy? Why do we so often sabotage the success we long for? The answer is not letting go of our past. Freeing ourselves from our previous choices can be the difference between staying stuck in emotional pain and rising up to become the person God created you to be. What do you want to do? How desperate are you to change? Are you ready to start dealing with the pain and find true healing? 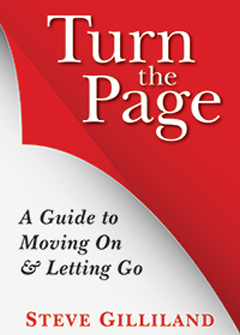 TURN THE PAGE is not a feel-good story, but a roll-up-your-sleeves, down and dirty look at moving on and letting go. Hall of Fame Speaker and bestselling author Steve Gilliland helps you connect the dots to your self-defeating behavior, then gives you practical how-to advice about letting go and feeling peaceful. Turning the page is a powerful first step to freedom. LETTING GO OF THE PAST IS NOT EASY. WE CLING TO FRUSTRATION AND WORRY ABOUT THE FUTURE AS IF THE ACT OF FIXATION SOMEHOW GIVES US POWER. If a little time has passed and you have not been able to TURN THE PAGE and move on with your life, you need to take a more proactive approach. We often hold onto our pain far beyond its ability to serve us. We replay past mistakes over and over again in our head, allowing feelings of shame and regret to shape our actions in the present. No matter what has happened to you in the past, this book will show you how to take control of your life and make a great future for yourself.